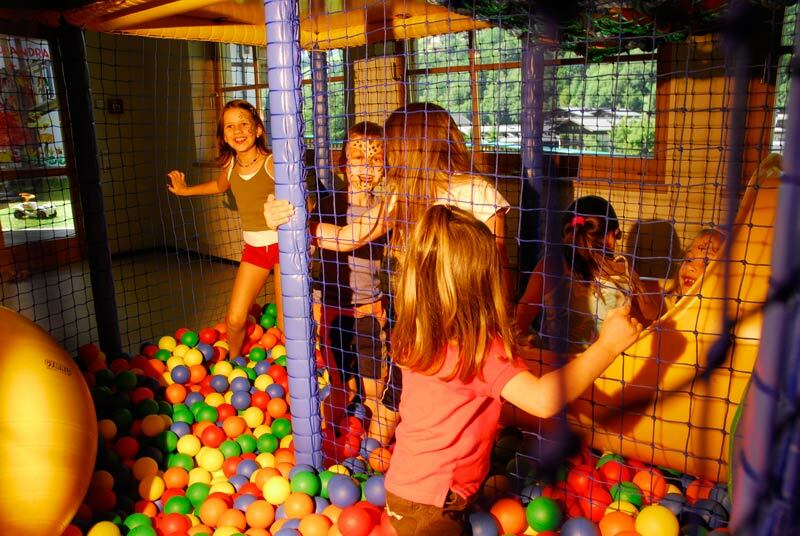 Your stay in our family-resort Egger should be an adventure for your children too. Thus we offer extensive childcare with a lot of entertainment and educational factors. Additionally professional guest hosts take care of teens. Teenies – leisure area: table tennis, billard, darts, table football. Some days of the week we offer continual care the whole day long. The printout of the weekly program is available when you check in or when you visit the club for the first time. Table tennis, table football and billard…. When mum and dad want to be alone for a few hours, the children are more than happy to oblige! At last they can go to the children’s club! There is always something going on and friendships are made in a flash. The diverse, exciting and fun children’s programme is tuned to the needs and wishes of children who cannot wait to rush from one highlight to the next. In our traditional Children’s Hotel you can leave the care of your little darlings in the hands of our qualified child minders. Any safety requirements are ensured at all times! The parent can of course have a look in at any time just to make sure so that the remaining “time off” can be enjoyed worry free! 230 m2 of indoor theme park fun! 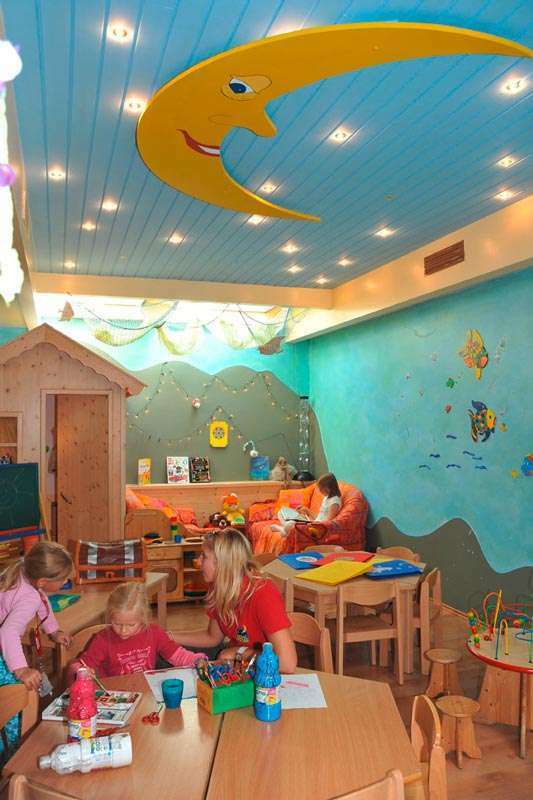 Three club rooms, designed with love and creativity (Baby Paradise, “Seegrotte” marine grotto and “Seelagune” ocean lagoon) invite our young guests to play, dream, snuggle up and take part in many special activities offered by our caring and professional toddler and children’s entertainers! The softplay adventure area with its two floors is open around the clock and is available for fun and games also outside the day-care times. Table football and table tennis are also available in the multi function room. In the Egger’s Cinema, there’s a weekly request programme for kids and teens. Egger’s Theatre offers guest children the opportunity to get a taste of the theatrical and tread the boards gathering first experience of the world as a stage under the guidance of professionals. In the Mini-Art Hotel using various techniques, our young artists taste fame creating works of art fit for exhibition and amazing the adults! From summer 2009 onwards, a NEW playground will be available. The foundations were laid in autumn 2008 and a lot of hard work and planning will ensure its completion by the following summer season! You can book for your infant child the package without or with baby care (different rates). Euro 15,- per hour on Saturday and Sunday and in the evening. Für die “Großen” ab ca. 10 Jahren bieten wir in der Sommerferienzeit Juli und August ein abwechslungsreiches Animationsprogramm mit Spaß, Unterhaltung, “Kreatainment”-Workshops und sportlichen Wettkämpfen im “Teens Club” an. Wer gewinnt die Sommer- oder Schwimmolympiade? Wer lernt beim Nixenkurs wie eine Meerjungfrau zu schwimmen? Wer hat bei der Eltern-Kind Ralley die Nase vorn? Welches Team kann die Schatzsuche oder die beliebte Schnitzeljagd gewinnen? Wer siegt bei “Wetten, dass”? Welches Familienteam kann die Familienolympiade für sich entscheiden? Wer kennt die spannendsten Kreis- und Gesellschaftsspiele? Wer schafft die meisten Parcours im Kletterpark? Wer beweist Zielsicherheit beim Bogenschießen? Wer hat die coolste Idee für die wöchentliche Egger-Show?